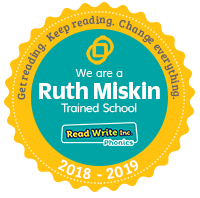 Read Write Inc. is a whole-school literacy programme designed and developed by Ruth Miskin, one of the country’s leading authorities on teaching children to read. The programme aims to create fluent readers, willing writers and confident speakers. When a child joins Dunbar Primary School, their reading ability is assessed within the first few weeks. If the child has gaps in their knowledge of phonics, they are assigned to their own small group for regular sessions with a trained instructor using Read Write Inc. methods. 1) Participation – As they are in small groups, children participate fully in every session. They are able to maintain high levels of concentration and they do not miss key elements of the teaching. 2) Praise – Children work together as partners. They take turns to teach and praise each other. They are motivated by praise from their teachers and teaching assistants. 3) Pace – Sessions never drag. The lively pace keeps every child fully engaged and on task. 4) Purpose – Every instructor has been trained in Read Write Inc. methods. They know the purpose of each activity, and how it leads into the next. 5) Passion – Instructors, too, become passionate about their teaching as they see the children enjoying the progress they are making. This Session at Dunbar Primary School we have invested significantly in the training of teachers and classroom assistants to carry out the programme effectively with small groups of children. These groups are organised according to their specific needs, and the specific sounds and letters are taught in fun and engaging ways. Each session lasts about 20 minutes in P1 initially rising to an hour and includes a variety of activities delivered with pace and rigour. Children have the opportunity to learn sounds which are reinforced during the session with reading and writing activities – learning is put into practise. As children progress through the levels, they are regularly assessed to ensure they are placed in groups most appropriate for them. If a child is found to be struggling, 1 to 1 sessions are arranged for him/her to catch up with the group. Children may also be ‘fast-tracked’ to a more able group when their progress warrants this. If your child would like to practise their sounds at home then please click on the appropriate level at the bottom of the page. Ruth Miskin also suggests that children gain a great deal from knowing a short number of stories very well. Familiarity with these stories can help children to understand how stories are structured and the different kind of genres they may encounter. Your children will be read all of these books while on the RWI programme at WJS. The list is down loadable at the bottom of the page in case parents/careers would like to purchase/ or borrow any of the books to share at home. We are convinced that the Read Write Inc. programmes will continue to make a very positive impact on the ability of our pupils, at all ages, to develop their reading and writing. Read Write Inc can support all children to make progress and it is particularly suited to supporting those children with dyslexic tendencies. It is a recommended resources by the British Dyslexia Association. Should you wish any further information or to discuss any aspects of the programme, please contact your child’s class teacher or Mrs Roseanne Rice. This is a support for parents in understanding of the order of teaching sounds. Below, you’ll find a series of information and tutorial videos explaining the basics of Read Write Inc. Phonics. If your child is learning to read with our programme, these videos will help you support them at home. If you have a question for us, you can easily get in touch with us via our Facebook and Twitter pages.